Our air purifiers use two different methods of cleaning your air, depending on the specific model you choose. The home use units generally use a combination of Ionisation and Active Oxygen; the commercial units generally use only Ionisation. Ionisation is the process of emitting electrical energy into the air which then energizes particles in the air. The particle will then attach itself to a grounded object or combine with another particle or particles until it is heavy enough to be dropped by gravity. This process effectively eliminates solid particles from the air. The second process is oxidation using activated oxygen. Activated oxygen will alter and decompose gasses much like the process of burning. Most chemicals will be converted into carbon dioxide and water vapour. 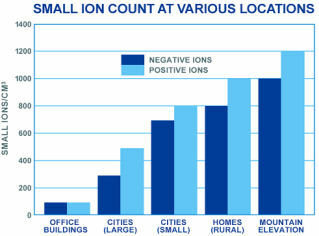 Both positive and negative ions are found in the normal environment. In the early 1900's, Albert Einstein (yes, that Albert Einstein) found that mountain air contained a much greater number of ionised particles and he theorised that this might account for some of the known health-giving properties on mountain air. These bullet points illustrate the most common air purification methods and how they compare to the Bentax technology. Pleated type filter that has proven 99.97% efficient to trap particles 0.3 microns and larger. Can be incorporated into central HVAC systems or used as stand alone units. Can not treat the source of contaminants, can only filter contaminated air from entering an area. Is not effective on many mold spores, bacteria and viruses. Will restrict airflow when incorporated into central systems and increase energy costs. Requires several maintenance visits to replace used filters each year. Disinfects by passing air through ultra-violet light. UV light can only treat contaminants that pass directly through the light field. Ambient air that does not enter through the light field will not be affected. UV is dependant on contaminants being exposed to the light field for a time period long enough for the contaminant to be treated. UV is dangerous when exposed to humans. Some elements (for example Aspergillus Niger) are resistant to UV altogether. Will not restrict airflow when incorporated into central systems. Requires maintenance each year to replace worn bulbs. Creates single polarity ionization to attract particles. The single polarity will use walls or any nearby surface as the needed opposite polarity. This will attract the charged particles to that surface, producing "black or dirty walls". Will only work in a small area around the unit (8 to 9 inch radius). Uses high energy (25,000 to 40,000 volts) to produce ions. Mostly ineffective against bacteria, spores and volatile organic compounds (VOCs). Creates uncontrollable positive ion output - coupled with high energy output will create ozone. Will interfere with radio equipment, etc. Can not be incorporated into central HVAC systems. Examples of these units are the many "stick style" portable units. Will collect particles on a metal surface contained in the unit and produces single polarity ions by electrifying collector plates. Only effective inches from the unit. Ineffective against bacteria, spores and VOC compounds. Cannot be incorporated into central HVAC systems. Disinfects air by producing and distributing a controlled amount of positive and negative ions which restore oxygen molecules to an active state. By controlling positive ion output and using low energy (2,200 to 3,000 volts) ozone is not produced. Effective against bacteria, mold spores, VOC compounds and particles. Can treat the source of contamination. Requires maintenance each year to replace worn tubes.